Beginning in the 1990s, Florida made it easier for parents to choose schools outside their school district. The Florida Department of Education boasts that the state “leads the nation in school choice options.” About 780,881 students — 29 percent of all K-12 public school students — in the Sunshine State attended a public school through one of the state’s school choice programs in 2012. Under Florida’s “controlled open enrollment” policy, parents can choose to enroll their children in an in-district public school other than the one assigned to them based on where they live. Whether parents will have this intradistrict choice is ultimately up to local school boards, but 75 percent of districts do allow for this type of parental choice. About 11 percent of Florida students took advantage of this policy. Parents in Florida can also choose from a number of charter schools. Charter schools are authorized (“chartered”) by local school districts[*] and funded by the state, but often managed independently under a performance contract. The first five charter schools opened in Florida in 1996, and over the course of the next five years, the number increased dramatically, reaching 201 by 2002. Between 2002 and 2012, the number of Florida charter schools more than doubled, increasing to 518, while enrollment in charter schools more than quadrupled, rising from 40,465 to 179,940 — about 7 percent of Florida’s total K-12 public school enrollment. Florida also enabled students to use publicly financed vouchers to attend private schools. From 2002 to 2006, students in schools that received two consecutive F’s under the A-Plus Program were eligible to receive a voucher to pay for private school tuition. [†] Since 2000, the state-managed McKay Scholarship Program has also enabled parents of students with disabilities to obtain vouchers to send their children to a private school of their choice. The McKay program served 23,011 children with special needs during the 2012-2013 school year alone. Parents whose students qualify for a free or reduced-price lunch under the National School Lunch Program can also apply for private school scholarships funded by Florida corporations under a state tax credit program. The Florida Tax Credit Scholarship Program was started in 2001 and provides corporations with a dollar-for-dollar tax credit for the money they donate to “Scholarship-Funding Organizations,” which in turn finance the private school scholarships. Enrollment in this program has nearly tripled since 2007. Now, the tax credit program serves nearly 51,000 low-income students. Florida also makes a number of online learning options available. Florida Virtual School, which opened in 1997 and primarily supplements course offerings available through local school districts, leads the country in the number of course enrollments for a state-run virtual school with 259,928 in 2011. In 2001, districts were able to set up franchises of FLVS and enroll students full-time in online learning environments. By 2009-2010, all students in Florida had the ability to complete all of their required coursework online through the District Virtual Instructional Program. For the 2010-2011 school year, Florida had more students enrolled in online programs than did any other state. [*] A decision to deny a charter school application by a local school board may be appealed to the Florida State Board of Education, which can force a local school board to accept the charter. Fla. Stat. § 1002.33(6)(c). 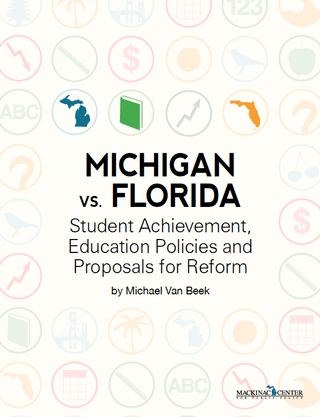 State universities and a “Florida College System institution” may also authorize certain types of charter schools. Fla. Stat. § 1002.33(5)(a)2-4. [†] In 2006, the Florida Supreme Court ruled in Bush v. Holmes that providing vouchers for private schools for these students violated the state’s constitution. Greg Forster, “Lost Opportunity: An Empirical Analysis of How Vouchers Affected Florida Public Schools,” (Friedman Foundation for Educational Choice, Foundation for Excellence in Education, The James Madison Institute, 2008), 11-12, http://goo.gl/d4dxt (accessed May 16, 2013). “School Choice Options,” (Florida Department of Education, 2012), 1, http://goo.gl/lfjz2 (accessed March 20, 2013). “School Choice Options,” (Florida Department of Education, 2012), http://goo.gl/lfjz2 (accessed March 20, 2013). “Charter Schools Program,” (Florida Department of Education, 2013), http://goo.gl/m8N5w (accessed March 20, 2013). Ibid., 1-2; “School Choice Options,” (Florida Department of Education, 2012), http://goo.gl/lfjz2 (accessed March 20, 2013); “Charter Schools Program,” (Florida Department of Education, 2011), http://goo.gl/F6czA (accessed May 17, 2013). Jay P. Greene and Greg Forster, “Vouchers for Special Education Students: An Evaluation of Florida’s McKay Scholarship Program,” (Manhattan Institute, 2003), 1, http://goo.gl/nxNt8 (accessed June 4, 2013); “Florida — John M. McKay Scholarships for Students with Disabilities Program,” (The Friedman Foundation for Educational Choice), http://goo.gl/xCzHf (accessed May 2, 2013). “Florida — John M. McKay Scholarships for Students with Disabilities Program,” (The Friedman Foundation for Educational Choice), http://goo.gl/xCzHf (accessed May 2, 2013). “Florida ­­­— Florida Tax Credit Scholarship Program,” (The Friedman Foundation for Educational Choice), http://goo.gl/4wbO0 (accessed May 31, 2013). “FTC Scholarship Program,” (Florida Department of Education, 2011), http://goo.gl/RjBWy (accessed May 31, 2013). “Florida — Florida Tax Credit Scholarship Program,” (The Friedman Foundation for Educational Choice), http://goo.gl/4wbO0 (accessed May 8, 2013). John Watson et al., “Keeping Pace With K-12 Online Learning,” (Evergreen Education Group, 2011), 30, http://goo.gl/KI2QB (accessed May 31, 2013). Watson et al., “Keeping Pace with K-12 Online Learning: An Annual Review of Policy and Practice,” (Evergreen Education Group, 2010), 71, http://goo.gl/d0FjK (accessed May 31, 2013). Watson et al., “Keeping Pace With K-12 Online Learning,” (Evergreen Education Group, 2011), 81, http://goo.gl/KI2QB (accessed May 31, 2013).